Our daughter is Chinese by birth. Until recently she has not wanted to explore the heritage of her homeland. While we incorporate some Chinese culture into our lives, we never pushed her to go further than she wants. This year, she has been asking more about China and Chinese culture. 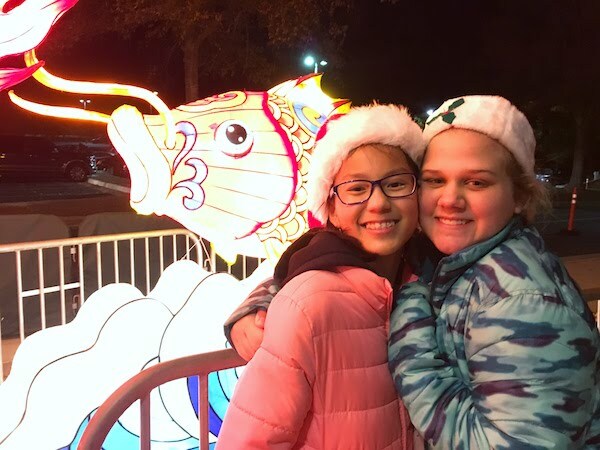 When I was provided the opportunity to attend the Chinese Lantern Festival at Cary’s Koka Booth Amphitheatre, I knew we’d be creating memories with her. I didn’t know quite how spectacular the display would be! China has celebrated a lantern festival for close to 2000 years. The festivals start on the 15th day of the first month in the lunar calendar. And, they coincide with the Chinese New Year as well. Essentially, the story goes that a crane flew down to earth from heaven and was killed by the people of a village. The Jade Emperor became angry because the crane had been his favorite. So, he decided to kill all the people of the village. To protect the villagers, his daughter warned them of her father’s anger. A wise elder ordered everyone to hang red lanterns and set off firecrackers to fool the emperor into thinking the village was already ablaze. It worked. Today, the Chinese lantern festival continues with celebrations across China and the world. 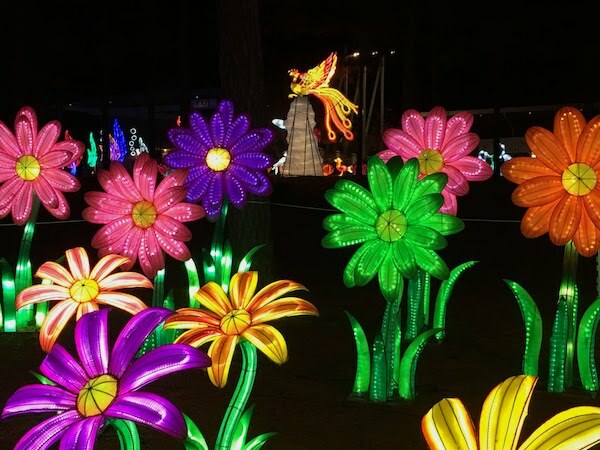 Cary hosted its first Chinese lantern festival in 2014. This year’s festival, the fourth, marks the start of a four year contract for the event at the Koka Booth Amphitheatre. That’s great news for the people of central North Carolina and for visitors from around the world. 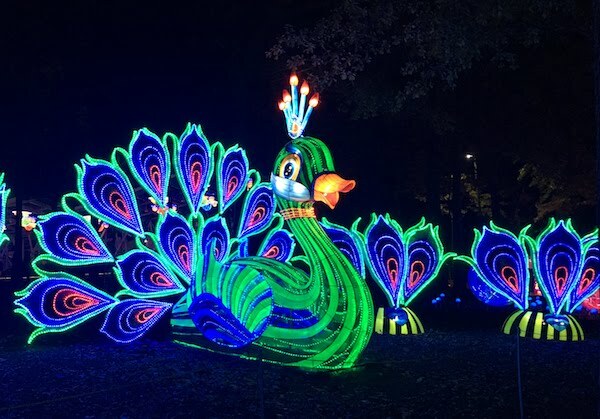 The festival brings Chinese culture and tradition to the Cary area, allowing people to appreciate not just the craftsmanship, but also artistic performances throughout the festival season. 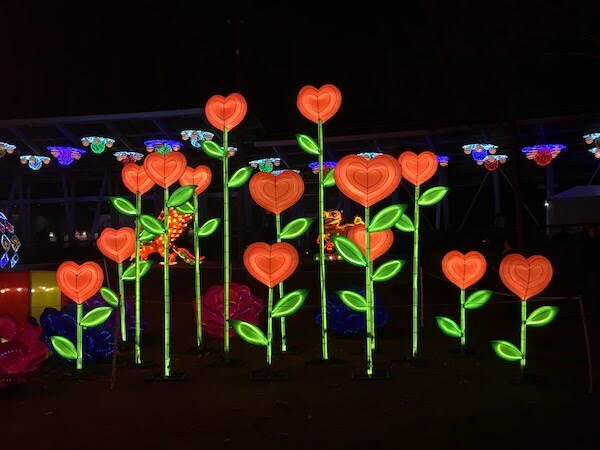 The displays are created specifically for the grounds of Koka Booth Amphitheatre, so if you have been to a Chinese lantern festival before, this won’t be the same! This year’s festival includes 25 displays, all made of hand painted silk stretched over steel frames. 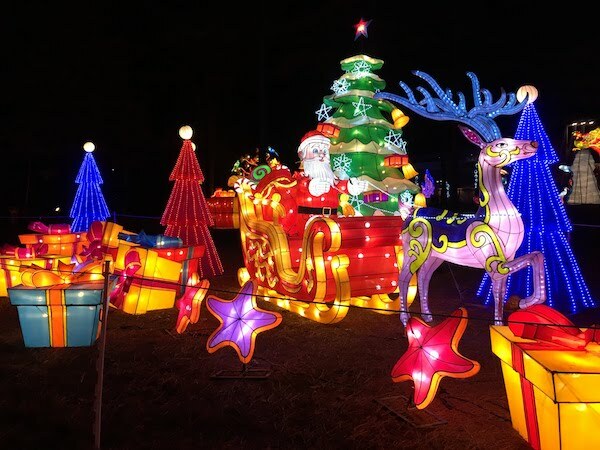 The displays are lit by LED lights — providing an intense glow that brings oohs and ahhhhhs from all ages! A total of 25 displays fill the grounds at Koka Booth Amphitheatre. It took 25 artisans from Zigong, Sichuan (the capitol of Chinese lantern-making) more than three weeks to put this display together. Chinese acrobats and musicians perform each evening. Guests can also purchase souvenirs and snacks, including hot cocoa! Please remember that all displays are hands-off! For the most part, that rule is fairly easy to follow, but the Chinese Lantern Gallery is quite tempting to all. Since this was our first festival, I wasn’t sure what to expect. These tips come from my personal experience — and from friendly staff at Koka Booth Amphitheatre. Visit on weeknights if possible. Crowds are much smaller, allowing ample opportunities to view each display and take unobstructed photos! Plan to arrive at 6:30 or later. The box office opens at 3 p.m., though the festival starts at 6:00 p.m. I got my tickets during the day so I wouldn’t have to stand in line that evening, and the lady working there said there’s a mad rush at 6:00, but that the crowds die down on weeknights by 6:30. She was right. We walked right in at 6:32. Related to that, purchase tickets in advance to avoid standing in that queue. 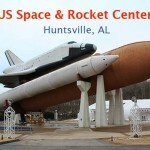 Click here for ticket prices and to purchase online. All bags are searched at entry. Don’t touch the displays. After passing through the red lantern arch (called the Chinese lantern gallery), a table is set up with displays from past years that you can touch. A staff person there can answer any questions about how the displays are made as well. Watch the live performances! They’re pretty incredible, and offer a further glimpse into Chinese culture. 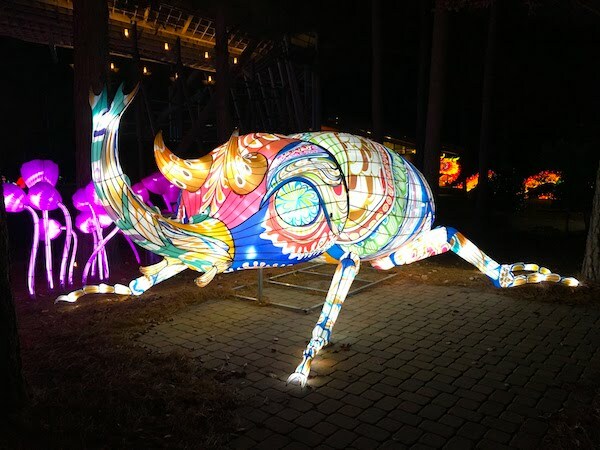 Be sure to get a Chinese Lantern Festival Guide. It explains the meaning of each display. Click here to plan your visit: Hours, directions and ticket prices are all available. Our whole drive home, we debated over the displays. Each one is beautiful, but to choose just one favorite is tough! These are the “finalists”. Pandas — just look at those faces! Daisies (Gerberas) — and the amazing Phoenix in the background! A rhinoceros beetle — particularly beautiful with this paint job! I am really glad I got to take Ellie to the Chinese Lantern Festival. We got to celebrate her heritage and appreciate the beautiful craftsmanship. Her grins and giggles all evening long were music to my ears. As long as the festival comes to Cary, we’ll be visiting. Lucky for us, that means at least three more years. Lucky for you, this year’s festival just got started. It’s open through January 14, 2018. 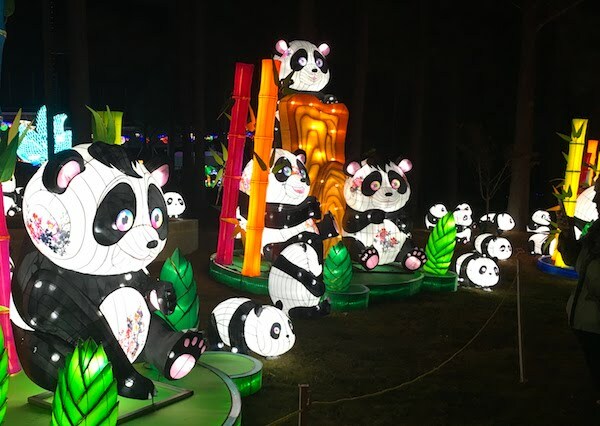 Looks like you had an amazing time at the Cary’s Chinese Lantern Festival! 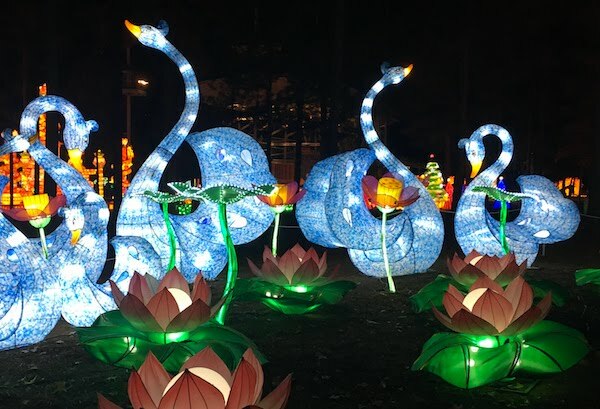 The lanterns are so beautiful and so colorful – I really like the swan one! I really hope to visit a lantern festival in the future! It’s nice to know that you let her learn about her Chinese blood. This is a great way to learn as well the culture. I love the design and your pictures! What a beautiful display! I would love to see a Chinese Lantern festival. I love the bright colors and I’m so glad you got to make some memories with your daughter. Oh wow! The level of creativity in these Chinese lanterns is incredible. I love the bold and vibrant designs. I love cultural experiences. What an absolutely STUNNING festival. It is so important for us as a country to celebrate our differences, and this event is a great way to do that. I love celebrating Chinese New Year in Chicago’s Chinatown. Oh my word! My kids would absolutely love this. It looks beautiful from all of your photos! We experienced this as a family and it’s really fun! I’d like to attend again soon! 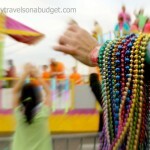 I have always wanted to see a festival or parade with these. They look so fun and colorful and beautiful! The lanterns looks really impressive. It does look good to watch, it’s visually enticing and we learn so much about the culture. This is just so impressive. 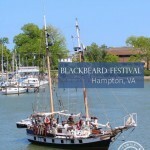 I love that there are cool festivals like this happening here in NC! We have never attended a chinese parade but the pictures look beautiful. So many colors. Know the family would enjoy this if we ever get a chance. Candy, the Chinese Lantern Festival is celebrated in many cities across the world — maybe there’s one near you. I hope to go to one in Canada sometime soon. I think the snow would make it even more magical — though this was beautiful! This looks so beautiful with all the colors and lights. What a fun family holiday event! It was fabulous!!! We plan to do it again next year — and as long as the festival keeps coming to Cary, NC! How amazing! I would love to go to a festival like that, the lights and every thing is so bright. Heather, there might be a Chinese lantern festival near you. It is one of the brightest festivals I’ve ever seen — so pretty! That looks amazing. Each of those lanterns are beautiful. I love all the colors and designs. The festival was even prettier in person! That is wonderful your city hosts this event. 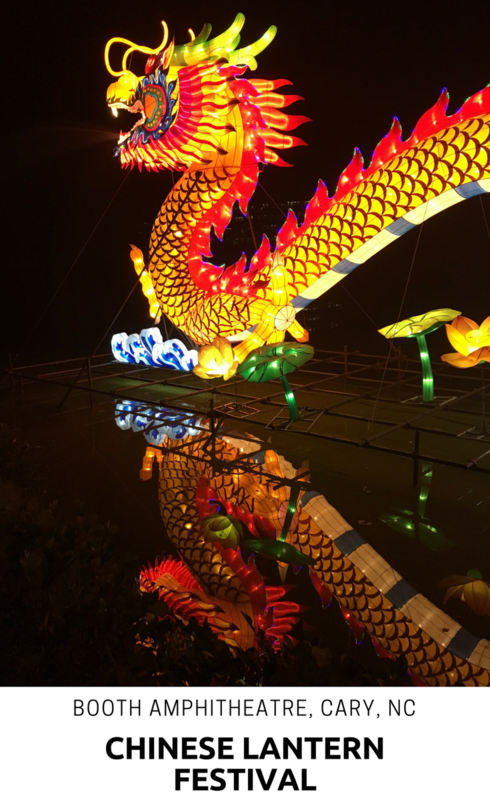 We were expats in Beijing for a bit and we saw a lantern festival in the city – it was truly amazing! The Chinese are steeped in their culture and heritage and family is so tight! Our daughter is Chinese, so sharing the pride of her culture with her made this event even more special. She has a hand-painted silk kite hanging in her room. What a great festival! I want to go. The displays are so bright and beautiful and the daisies are so pretty! The daisies were my favorite — except for the Phoenix. I couldn’t get a good closeup photo of the phoenix though — it was quite popular! So pretty! I think this was the same displays that were in Texas last year. We had a lot of fun checking them out. Some displays might be similar from place to place, but they design each show specific to the venue. So, your Chinese dragon might be 193 feet long when another dragon is 220 feet long. I love that they change the show every year at a destination too. Oh how amazing. I have never seen anything like that, but would love to experience that festival with my family. Wow. They have them throughout the country — and each one is unique to its venue. Maybe there’s one near you. It’s a wonderful tradition. Happy holidays!